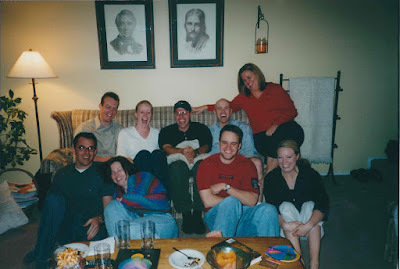 Years ago when I was single and living in downtown Salt Lake, I had a group of amazing friends. We were like a little family. We did everything together and supported each other through a lot of highs and lows. One of the best things we did together was Sunday dinner. We would always get together and spend Sundays, just like a family. Most of the time we would gather at my house. Sometimes and Ken & Jeremy's, but mostly the cooking was all me. I would experiment with all kinds of recipes on my poor friends, and they always let me know what they liked and didn't like. I don't know why I'm writing about this time in my life, except that this soup always reminds me of my salt lake family. We've all come a long way in our lives and moved to various places through out the valley. We don't get to see each other as often as we'd like, but sometimes when I eat certain foods it take me back to those Sunday dinners and reminds me of some very amazing people, that in my heart will always be family! And you all know who you are. If you ask Jeremy he will tell you that the best way to eat this soup is putting the sour cream, cheese, cilantro, & chips at the bottom of the bowl and pouring the soup over top. And I would have to agree, but for photo purposes that didn't work. 1. Sauté onion and garlic in large stock pot for 2-3 minutes. 2. Add all other ingredients and bring to a boil. Simmer for 15-30 minutes to emulsify flavors. 3. 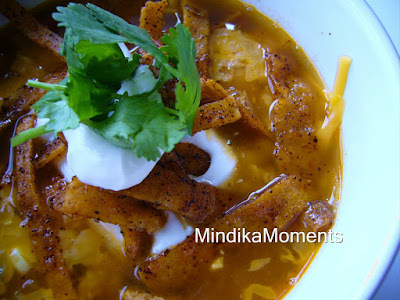 Serve each bowl topped with grated cheese, sour cream, spiced tortilla strips, cilantro and fresh squeezed lime. 1. Cut tortillas into small strips of desired length. 2. In a large plastic bag drizzle with olive oil, salt and chili powder. 3. Toss bag to coat all strips. 4. Spread strips on a foil lined cookie sheet, sprayed with cooking spray. 5. Bake at 425 degrees for 20-25 minutes or until desired crispness. I just found your blog and I LOVE IT? I have already made 3 of your recipes and plan on many more in the future. Keep it coming. I am very good friends with Tabatha Fergus. I think she knows you cause she sent me your blog. Thanks Heather! Tabatha is my cousin. Oh, yum! I've never thought of adding spices to tortillas when making tortilla strips. They look great.